For nearly 19 years Joe Carr wrote a column for Flatpicking Guitar Magazine on the topic of rhythm guitar. Each of Joe’s articles not only addressed a very interesting and important rhythm guitar topic, he also provided wonderful historical context in his text, tabs and recordings. He brought our readers many wonderful examples of bluegrass, folk, blues, jazz, swing, Irish, and Western swing rhythm styles. Over the years Joe’s column featured transcriptions of great early rhythm players such as Riley Puckett, Red Smiley, Jimmy Martin, Jimmie Rodgers, Edd Mayfield, Hank Snow, Doc Watson, Rodney Dillard, John Herald, Josh White, Charlie Monroe, Homer Haynes, Eldin Shamblin, Tommy Allsup, Charlie Waller, Arther Smith, and Lonnie Johnson. His column also covered the styles of more contemporary players like Clarence White, Tony Rice, Charles Sawtelle, Peter Rowan, Roland White, Del McCoury, Wyatt Rice, David Grier, and John Doyle. Additionally, his column covered many technical rhythm guitar topics such as extended chords, chord substitutions, and alternate chord progressions. Joe’s rhythm guitar knowledge was extensive and he graciously and generously shared it though his column in this magazine. 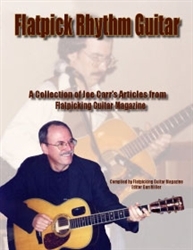 In this book Flatpicking Guitar Magazine editor Dan Miller has collected all of Joe's informative articles (over 100 in all) in one place. The comes with 2 audio CDs. Homer Haynes: Rhythm Guitar Star - No Joke! Ahead of the Beat? Behind the Beat? I Was Clarence White for 45 Minutes!